I wonder if Morgan Freeman had déjà vu when he first read the script to The Dark Knight. In this film, an unidentifiable psychopath is going around killing people to teach twisted lessons about morality. He leaves clues for the police to follow, and he eventually turns himself in and demands the hero kill him. All of this probably sounded really familiar to Freeman because 13 years before he had starred in another film called Seven that used all of those elements and ended in almost the exact same way. I’ve already compared Batman Begins to Sherlock Holmes and The Dark Knight Rises to Toy Story 3, so why not finish off Christopher Nolan’s Dark Knight Trilogy with one more comparison? I don’t mean to take anything away from his series by making these comparisons. Nolan pulled off an incredible feat by making these three amazing films and, in the process, gave us one of the best trilogies of all time, right up there with the original Star Wars films. So let’s carefully dive into the mind of a psychopath and hopefully emerge on the other side unscathed as we examine The Dark Knight and Seven. He commits atrocious murders that are meant to teach lessons. He purposefully leaves clues for the heroes to follow his trail. A character acts as the voice of reason, warning the hero not to go too far. The villain wants the hero to kill him. A reckless hero takes the law into his own hands. The villain allows himself to be taken into police custody for a brief time. The hero’s love is murdered in a horrific way that leaves the hero emotionally scarred. The hero gives in and becomes the villain. Now let’s talk about each of these points. The name of the villain in Seven is John Doe, and the Joker in The Dark Knight may as well have the same name. Neither one has any identity apart from his assumed one. This is one of the most obvious similarities that clued me in to the fact that these two films are so similar. To ensure he remains anonymous, John removes his fingerprints over the course of several years. Of course, that wouldn’t help with his blood or DNA matching, but it sounded plausible enough in 1995. We are explicitly told in The Dark Knight that the Joker doesn’t have any matching record based on his blood, DNA or fingerprints. They are both spawned from insanity. The fact that they have no discernible origin makes them that much more horrific. We’ll never know what drove them crazy or if they were born that way. They are simply evil incarnate. The villain uses creative ways to kill people to teach “lessons” about morality. John orchestrates a symphony of slaughter on his way to exposing the Seven Deadly Sins. It’s horrible and mesmerizing to see the lengths he goes to in order to bring his twisted sermon to fruition. He forces a woman obsessed with beauty to choose between living with a permanently scarred face or killing herself. He forces an obese man to eat himself to death, and a lazy man to wither away by doing nothing for a whole year. And so on. The Joker’s murders seem random, but they are all designed to disrupt people’s plans and show how futile their attempts to control anything really are. At the start, he tells each of the bank robbers to kill each other for money, which shows there is no honor among thieves. He forces three of a mob boss’ goons to kill each other for the “privilege” of joining his merciless team to show them they’re nothing more than brutal animals. He forces Batman to choose between the woman he loves and the man who represents the soul of Gotham – and he lies about where to find each one. For all we know, the citizens and criminals on the boats at the climax may have had the detonators for their own bomb in an attempt to show that fear ultimately makes people kill themselves. The villain leaves clues, both blatant and subtle, to help his pursuers follow his trail. John writes the name of a deadly sin on the wall near his victim to make it clear what he is doing from the start. At one crime scene, he also uses another victim’s finger to leave a grouping of fingerprints that spell “Help me.” This leads the police to that victim, but it’s too late for him. John is constantly teasing the police with little hints that make them think they can stop him, but they’re never in time. One night, the Joker makes his intentions known that he will kill a judge, the Police Chief, and Harvey Dent, and the police’s efforts to prevent these murders ironically enable them to happen. 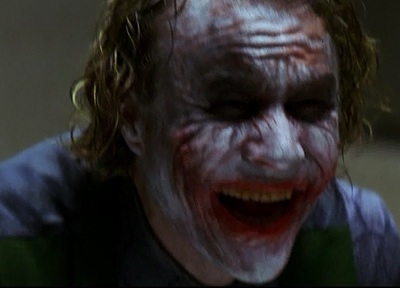 The police officers sent to put the judge into protective custody are actually working for the Joker, the Police Chief’s alcohol that he uses to soothe his nerves has been replaced with acid, and the officers sent to protect Dent are used by the Joker to gain access to Dent’s secure location. In another scene, the Joker identifies the mayor as his next target, and he also leaves one of his henchmen’s fingerprints in a hard-to-spot place that only Batman could identify. Even with the warning, the heroes are almost too late to prevent the murder. A wizened older man tries to help the hero control his emotions and avoid taking the string of murders personally. 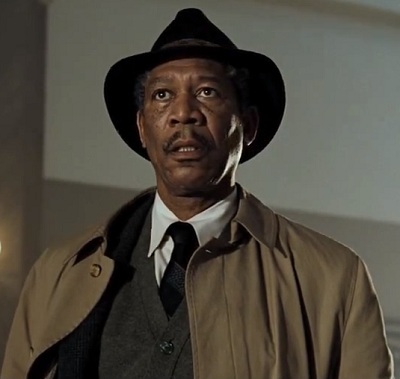 Morgan Freeman plays an experienced detective named William Somerset in Seven. He remains aloof and doesn’t show much emotion despite all the disturbing things he witnesses. His remedy for insanity is indifference. His advice about partiality is ultimately ignored by his younger partner. 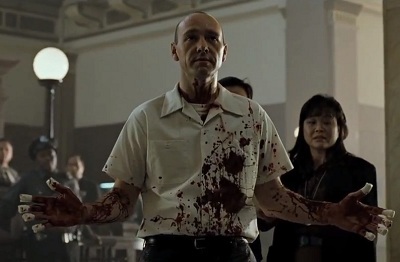 Freeman plays a somewhat similar role in The Dark Knight, especially when Batman plunges into some questionable moral areas to stop the Joker. But for the most part, Bruce Wayne’s butler Alfred Pennyworth shoulders a lot of these duties. He tries to convince Wayne to stay the course and not allow the Joker to provoke him into rash responses. In the end, Wayne takes his advice. But another character does not. The villain wants to prove his point about ambiguous morality by corrupting someone who is supposedly incorruptible. John reveals that his ultimate plan is to get Somerset’s partner David Mills to kill him. To get Mills to the point where he would be willing to violate his code of ethics, he has to push all of his psychological, emotional, and physical buttons. It leads to a devastating conclusion for everyone involved. The Joker knows that Batman’s only rule is to never kill anyone, so he does everything he can think of to get Batman to kill him. But when he realizes that Batman will never kill him, he turns his attention to Dent. He tries to push Dent over the edge by taking away everything he holds dear and replacing his calm logic with random chance. A hero recklessly acts in a way that foreshadows his later fall. Mills is emotionally compromised early on in the investigation of John. At one point he tracks down John’s apartment, but the problem is that he used illegal means to do it. Plus, he doesn’t have a warrant to search it. What does he do? He kicks open the door and bribes a neighbor to give false testimony to help him get a warrant after the fact. Unfortunately, he doesn’t find anything he can use for his investigation in the apartment. Just hundreds of journals filled with the random ramblings of a lunatic mind. After the mayor is nearly assassinated, Dent kidnaps a suspect and interrogates him with a gun to his head. No judge, no jury, no justice. Just a gun and a coin toss to decide whether the man lives or dies. Batman shows up before the situation can escalate any further, and he notes that the man Dent is interrogating is a complete psychopath who wouldn’t have any answers about the Joker. So it was all for nothing that Dent risked selling his soul. At a critical point in the film, the villain hands himself over to the police. After supposedly committing five of his seven murders, John shows up at police headquarters with nothing in his hands but blood. He is literally caught red-handed. Somerset and Mills are convinced he has something up his sleeve because why else would he turn himself in when the police were so far from arresting him on their own. They have no choice but to follow his orders to discover the last two victims of his scheme, though. All he wants is to be driven to a location in the middle of nowhere. After killing five people on Batman’s watch, the Joker allows himself to be caught and taken to the local police station. All he has in his hands and pockets are knives. The police try to take measures to keep him from escaping, but he eventually gets in a position where he threatens to slit an officer’s throat, forcing the rest of the officers to obey his wishes. And all he wants is a simple phone call. The hero’s love is senselessly murdered by the villain. When John, Somerset, and Mills arrive at the specified location, a truck driver arrives and delivers a package. Somerset goes to investigate, and he discovers that the box contains the head of Mills’ wife. John tells Mills that he killed his wife because he envied Mills’ family life. This shocking revelation leads him to make the case that he now deserves to die at Mills’ hands. This will complete his seven murders. The Joker orchestrates a situation in which either Dent or the woman he loves will die. Dent lives, but he is horribly burned in the process of being saved by Batman. When he wakes up in the hospital and discovers that his love is dead, he goes mad with anguish. Later, the Joker shows up in Dent’s hospital room to try to win him over to his side. 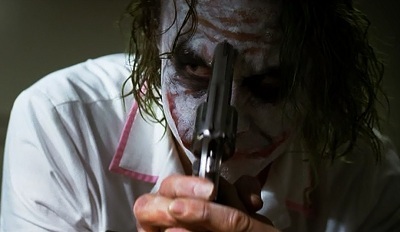 He convinces him that chaos is the only true justice and to prove his point, he puts a loaded gun into Dent’s hand and points it directly at his own forehead. Dent could kill the Joker right then if he wanted. Overcome by his emotions, the hero gives in to his darker side and becomes what he used to despise. Mills wrestles with his grief and struggles to do the right thing. But in the end, the thought of his dead wife leads him to shoot and kill the unarmed John. He then goes to prison while Somerset quietly mourns for him and his wife. 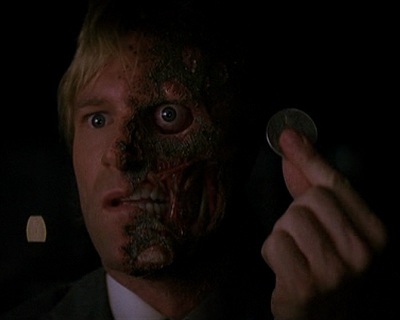 Dent doesn’t kill the Joker, but only because the coin toss comes out in the Joker’s favor. However, that doesn’t stop him from killing a police officer, mob boss and other people connected to his love’s death. Batman stops his killing spree, but he inadvertently kills Dent in the process. So both Dent and Batman break their cardinal rule because of the Joker. There’s little time to mourn for Dent as Batman takes the blame for Dent’s dirty deeds and has to run from the law. It’s a grim ending to a tragic story. The Dark Knight is basically a PG-13 version of Seven. Both films are distinct enough that most people wouldn’t notice their similarities on a casual viewing. I definitely prefer The Dark Knight over Seven. I’ve seen it numerous times while I’ve only seen Seven once. And that was many years ago. I will never watch it again. The Dark Knight leaves the audience with a sense of hope despite its depressing proceedings. Seven’s entire plot (and especially its climax) is utterly devastating and it doesn’t leave much hope for anything. Now if you’ll excuse me, I think I’ll go enjoy a nice, gentle movie to get all this disturbing imagery out of my mind: Snow White and the Seven Dwarfs. That scary old witch, animal heart in a box, poisoned apple, and spooky forest look a lot tamer to me now. All images are the copyright of their respective owner. This entry was posted in Movie Matchups and tagged action movies, batman, comic books, films, joker, movie review, movies, the dark knight. Bookmark the permalink. I love your write-ups Rob! Thank you for your insight, descriptions, and expressions. Nice catch.. Didn’t realize this until you mentioned it. I feel TDK is a better movie with a lot more depth to characters.